This edition is written in English. 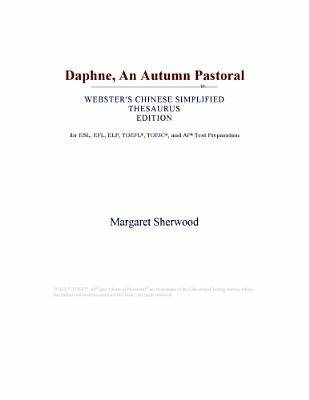 However, there is a running Chinese Simplified thesaurus at the bottom of each page for the more difficult English words highlighted in the text. There are many editions of Daphne, An Autumn Pastoral. This edition would be useful if you would like to enrich your Chinese Simplified-English vocabulary, whether for self-improvement or for preparation in advanced of college examinations. Websters edition of this classic is organized to expose the reader to a maximum number of difficult and potentially ambiguous English words. Rare or idiosyncratic words and expressions are given lower priority compared to difficult, yet commonly used English words. Rather than supply a single translation, many words are translated for a variety of meanings in Chinese Simplified, allowing readers to better grasp the ambiguity of English without using the notes as a pure translation crutch. Having the reader decipher a words meaning within context serves to improve vocabulary retention and understanding. Each page covers words not already highlighted on previous pages. This edition is helpful to Chinese Simplified-speaking students enrolled in an English Language Program (ELP), an English as a Foreign Language (EFL) program, an English as a Second Language Program (ESL), or in a TOEFL or TOEIC preparation program. Students who are actively building their vocabularies in Chinese Simplified or English may also find this useful for Advanced Placement (AP) tests. TOEFL, TOEIC, AP and Advanced Placement are trademarks of the Educational Testing Service which has neither reviewed nor endorsed this book. This book is one of a series of Websters paperbacks that allows the reader toobtain more value from the experience of reading. Translations are from Websters Online Dictionary, derived from a meta-analysis of public sources, cited on the site.